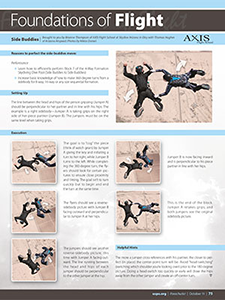 This page with skydiving references is meant to show you what kind of in­for­ma­tion is available to you out there. It is intended as a service only. We strongly recommended that you always double-check with the original source of information (and always read their disclaimer!)! Click on one of the chapter links below, and it will take you to the corresponding part of the page. 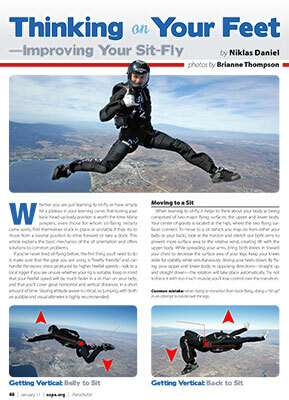 Understanding your canopy&apos;s glide slope is an essential skill that you need to apply on every jump. Whether you have to navigate back from a long spot or land your reserve in someone&apos;s backyard, this visual trick will increase your chance of success. Article by Niklas Daniel and Brianne Thompson. Camera and illustrations by Niklas Daniel. 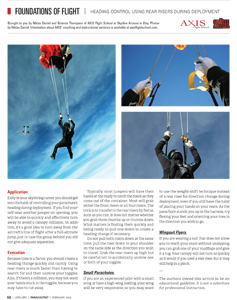 To become a more proficient canopy pilot, it&apos;s important to understand that the jumper is not separate from the canopy but is in fact part of an integrated system. Without delving too much into design specifics of parachutes, let&apos;s examine how a jumper&apos;s choices and actions affect the system as a whole. 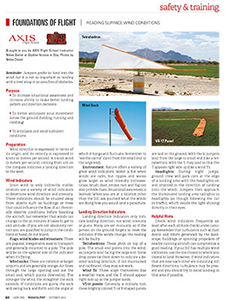 Understanding the difference between glide ratio and relative glide as well as how to best manipulate your canopy&apos;s control range to affect relative glide. Increase situational awareness and increase ability to make better landing pattern and direction decisions. Better anticipate your movement across the ground (holding, running and crabbing). Anticipate and avoid turbulent conditions. When a canopy pilot moves through air that is itself moving, that air continuously affects the parachute&apos;s speed and path over the ground. When you are trying to make it back to the landing area, merely pointing the canopy&apos;s nose toward the target may not be enough. Article by Brianne Thompson and Niklas Daniel. 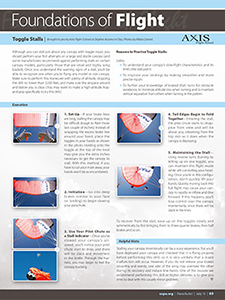 The purpose of this drill is to increase a pilot&apos;s awareness of a canopy&apos;s control range, awareness of a canopy&apos;s bank angle and angle of attack, landing proficiency, and long-spot navigation with a tail-wind. It also helps to gain mobility and increase the ability to ease congestion in the landing pattern as well as improve safety of emergency maneuvers near the ground. Stalling a parachute is a huge fear for most jumpers. 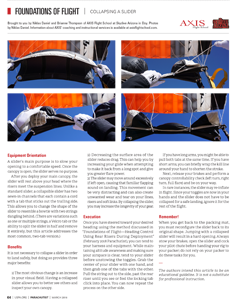 However, exploring stalls and the slow-flight range of a canopy gives jumpers a better understanding of how their parachutes work and helps them to fly better landing patterns, improve accuracy and execute consistently soft landings. 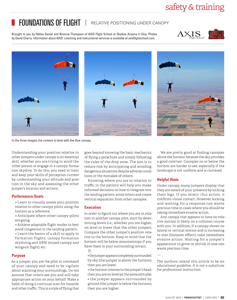 Anyone who takes a quick look at the USPA Canopy Piloting Proficiency Card will notice that most of the maneuvers are of the slowflight variety. The big question is, "Why do I need to perform stalls? What practical application does it offer?" 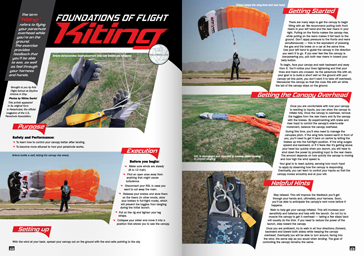 Learning more about slow flight and stalls not only prepares you to land your parachute better, but also teaches you just how versatile your wing can be. 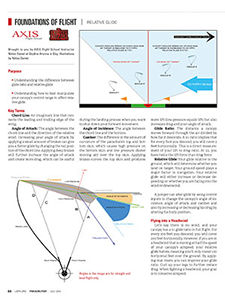 Reasons to practice toggle Stalls are to understand your canopy&apos;s slow-flight characteristics and its limits (the stall point), to improve your landings by making smoother and more precise inputs, to further your knowledge of braked (flat) turns for obstacle avoidance, and to minimize altitude loss when turning and to maintain vertical separation from others when turning in the pattern. 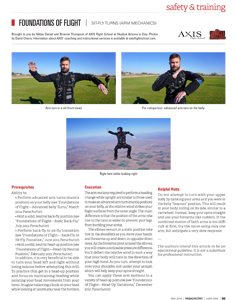 Training for intentional and unintentional water landings is an important part of a skydiver&apos;s learning progression and is required to receive the USPA B license. Unfortunately, most jumpers rarely give it much thought after their instructors sign them off for this skill, and few take the time to carefully consider the dangers involved. 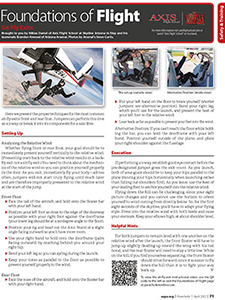 Learn correct hand placement while applying front-riser input to: avoid dropping a toggle, increase awareness of a canopy&apos;s control range, initiate a heading change, change the canopy&apos;s profile to increase descent rate and correspondingly increase airspeed, and allow a greater range of mobility within the landing pattern relative to other canopies. 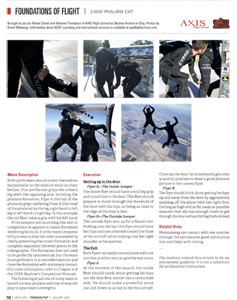 Understanding your position relative to other jumpers under canopy is an essential skill, whether you are trying to avoid the other person or engage in a canopy formation skydive. To do this, you need to train and keep your skills of perception current. Humans have built bridges longer than recorded history without complex engineering knowledge. But with a greater theoretical understanding, we have been able to create engineering marvels the world over. Similarly, you don't have to be an expert at theory to excel at bodyflight, but a deeper understanding should elevate the sport and your own flying to a new level. 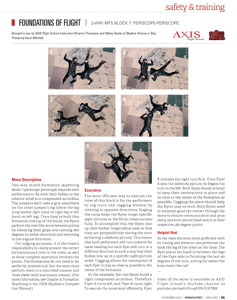 Episode 1—The Axis system and Frames of reference. Episode 2—Six directions of movement, Orientation borders and Range of motion. Episode 3—Move combinations, including Multi-axis combinations. Episode 4—Terminators, Real world applications and Conclusion. 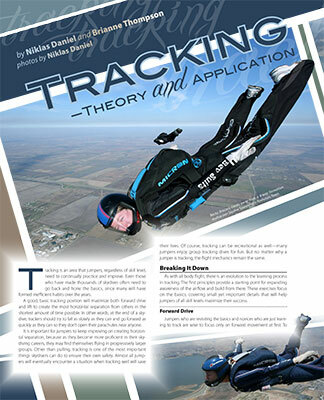 Learn how to lead a tracking dive and how to track away from a freefly jump. A jumper uses three sections of the body – the torso, the hips and the legs – to drive backward while in a head-up orientation. 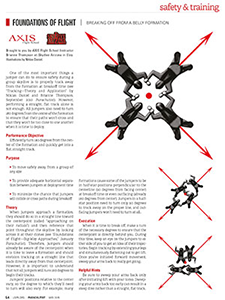 A flyer can apply inputs from just one of these sectors to make a small movement. 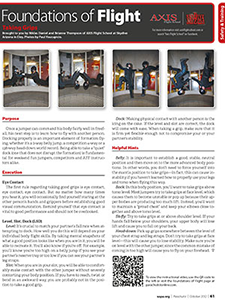 Eventu-ally, the flyer can begin to combine these inputs to move farther and more quickly in the backward direction. Article by Niklas Daniel with Brandon Atwood. Safety: increase awareness of your surroundings and create adequate separation from large groups before deploying your parachute. Performance: increase your physical awareness. Angle flying blurs the lines between horizontal and vertical flying. To excel at this flying method, you first have to understand your direction of travel, which comes with gaining spatial awareness. Angle flying blurs the lines between horizontal and vertical flying. To excel at this flying method, you first have to understand your direction of travel, which comes with gaining spatial awareness. You can do this best by first getting proficient at flying a flat track on both your belly and your back. A jumper uses three sections of the body – the torso, the hips and the legs – to drive forward while in a head-up orientation. A flyer can apply inputs from just one of these sectors to make a small movement. 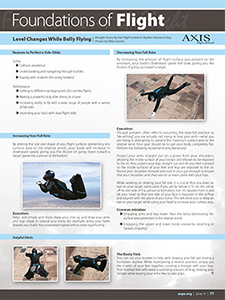 Eventually, the flyer can begin to combine these inputs to move forward farther and more quickly. This is a necessary skill for succeeding at head-down formation jumps (VFS and MFS). It is also essential for breaking off from a head-down jump and a prerequisite for in-facing carving and other angle-type jumps as well as floating or diving to a formation. Tracking is an area that jumpers, regardless of skill level, need to continually practice and improve. 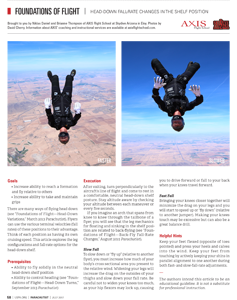 Even those who have made thousands of skydives often need to go back and hone the basics, since many will have formed inefficient habits over the years. A good, basic tracking position will maximize both forward drive and lift to create the most horizontal separation from others in the shortest amount of time possible. In other words, at the end of a skydive, trackers should try to fall as slowly as they can and go forward as quickly as they can so they don't open their parachutes near anyone. The goals of this drill are to increase your mobility and build air awareness. 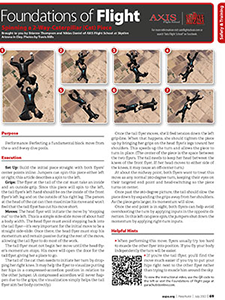 Performance: this maneuver is frequently used transition for back-to-belly freefly compulsory moves in competition. 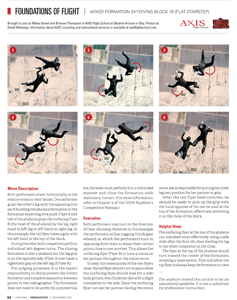 Safety: It is also a technique to recover from instability, used to clear airspace above you prior to deployment and its half-way point, backflying, is a bail-out procedure for freeflying (to prevent corking). Achieve greater mobility while flying head-down or while back-flying, and perfect a flying position that has a wide fall-rate range and allows the jumper to cover great distances. There are many reasons for learning to control fall rate while on your back, but one of the most common is the need to maintain level during a sit-fly jump when a partner loses his balance and “corks”. By back-flying at a slower fall rate, you will be able to minimize the vertical distance and perhaps be able to salvage what is left of your working time. 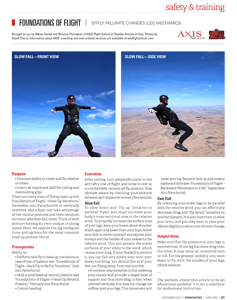 Get a better understanding of “the hill” (the directional shift in the relative wind immediately after exit) and and introduction to freefly exits. The goals of this drill are to increase your mobility and open a gateway to back tracking and angle flying. Docking properly is an important element of formation flying, whether it&apos;s a 2-way belly jump, a competition 4-way or a 138-way head-down world record. Being able to take a “quiet” dock (one that does not disrupt the formation) is fundamental for weekend fun jumpers, competitors and AFF instructors alike. Incorporating head switches into your turns can improve your turning performance by increasing your body and spatial awareness and mitigating blind spots. Jumpers can use this technique in any body-flight orientation and axis of rotation. 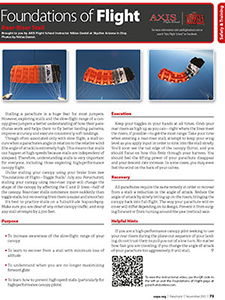 Once you reach breakoff altitude, your primary objective is to create a lot of horizontal distance from other jumpers in order to deploy your parachute safely. It may be difficult to know the location of every person on your jump, which is why it is your responsibility to clear your airspace while moving away. 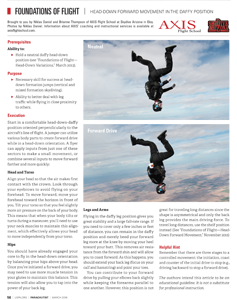 Avoiding collisions in freefall, during deployment and under canopy is paramount. 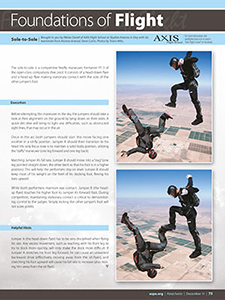 Learn all about the Mixed Formation Skydiving Block 8 (Bison), from move desciption to execution and helpful hints. 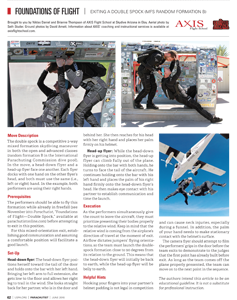 Learn all about the Mixed Formation Skydiving Random G (T-Squared), from move desciption to execution and helpful hints. 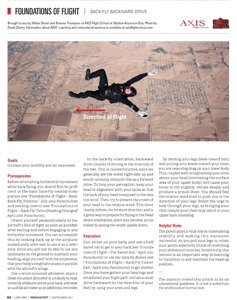 This introduction to freeflying wants to increase your fall-rate range and help you maintain your fall rate if you lose stability during a freefly jump. 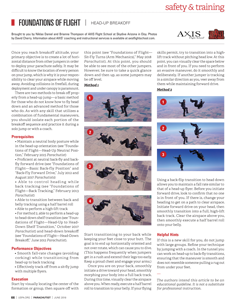 The purpose of these drills is to become more stable and mobile while back-flying solo, to gain the skill set necessary to take grips on other jumpers, and to gain greater air awareness that will allow you to perform more advanced maneuvers (such as back- to-head-up transitions). The ability to side slide in the back-fly orientation is a fundamental skill that flyers need in order to be effective in several disciplines. 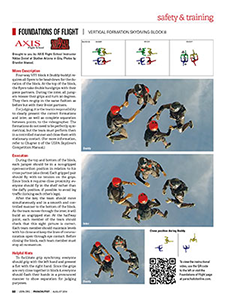 Flyers use lateral movements to reach other flyers, build formations, participate in dynamic disciplines, as well be able to make adjustments to any transition that passes through the back-fly orientation. 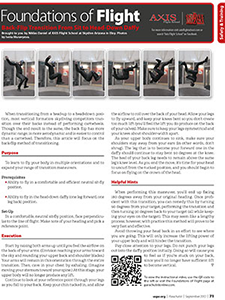 Before attempting side slides on your back, you should first be proficient at the back-fly neutral position. 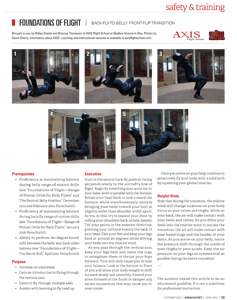 Learn how to fly through multiple axes and how to recover from sit-fly instability. 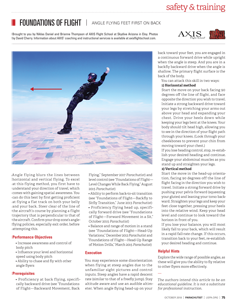 Increase air awareness, and gain an introduction to flying through multiple axes, including the vertical. This skill also assists in learning to fly head-up. 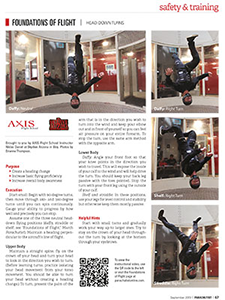 Increase air awareness, gain an introduction to flying through the vertical axis, and learn to fly through multiple axes. This skill also assists with learning to fly head up. Jumpers can induce heading changes in several ways. This article covers two basic ways, which isolate upper and lower body move-ments. After gaining proficiency at both, you can combine them. 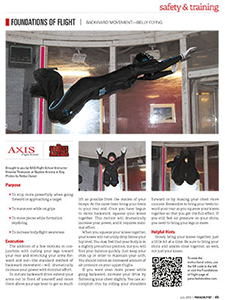 Increase your air awareness, stability and mobility, and improve your performance in vertical and mixed formation skydiving and dynamic tunnel flying. 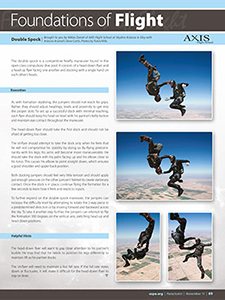 Learn all about the Mixed Formation Skydiving Block 7 (Periscope), from move desciption to execution and helpful hints. 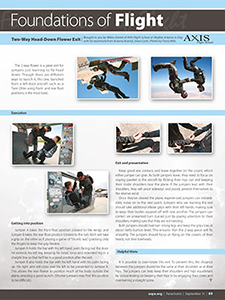 Learn all about the 2-Way Phalanx exit, from move desciption to execution and helpful hints. 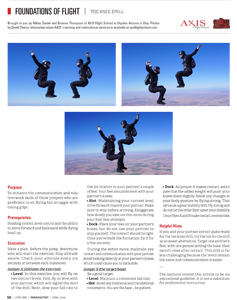 Two-way formation skydiving drills such as this one are beneficial because both flyers get an opportunity to work on their personal skills. 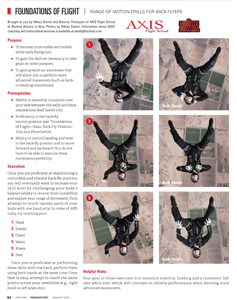 The ability to fly relative to another jumper is essential for all formation skydiving disciplines, no matter the size of the formation. Increase speed in a turn. Gain a greater lower-body awareness. Improve super-positioning (moving in more than a single direction). 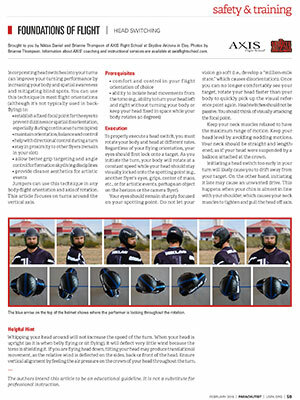 Learn how to add precision to a turn and how to stop more precisely. 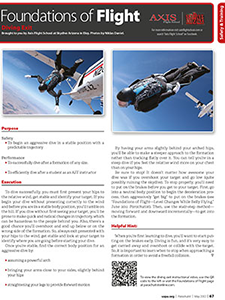 Stop more powerfully when going forward or approaching a target, learn to maneuver while on grips, to move pieces while formation skydiving, and to increase your body-flight awareness. 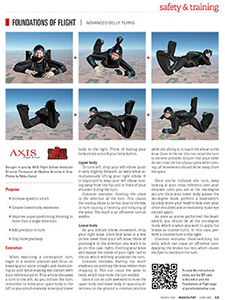 Learn how to properly approach a formation of any size from a dive and the appropriate sight pictures in a large formation. Understand proper docking on a large formation. 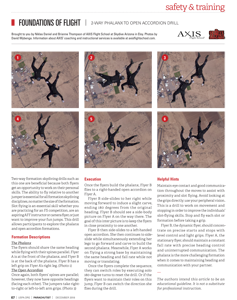 One of the most important things a jumper can do to ensure safety during a group skydive is to properly track away from the formation at breakoff time. However, performing a straight, flat track alone is not enough. This article is for jumpers who already have some experience flying camera and are trying to expand their knowledge of how to film formation teams in a competition setting. 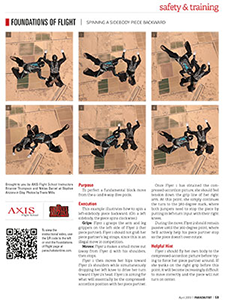 I will focus mainly on 4-way, because I believe it to be the most difficult formation skydiving discipline to film (aside from vertical formation skydiving), due to the many different exits and faster key speeds. However, once you have a firm grasp of shooting 4-way, the same principles can be applied to 8-way and larger formations. 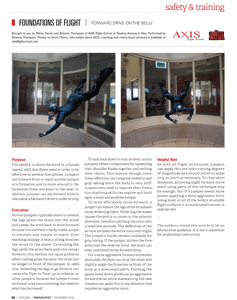 Safety: begin an aggressive dive in a stable position with a predictable trajectory. 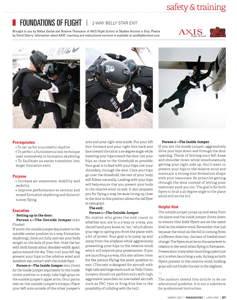 Performance: successfully dive after a formation of any size or efficiently dive after a student as an AFF instructor. 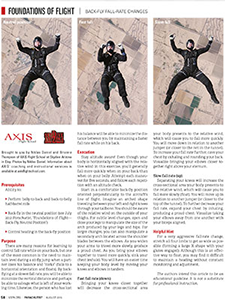 Set up for a successful skydive, perfect a basic and fundamental exit technique used extensively in 4-way formation skydiving, and facilitate an easier transition into larger formation exits. Article by Brianne Thompson with Thomas Hughes. 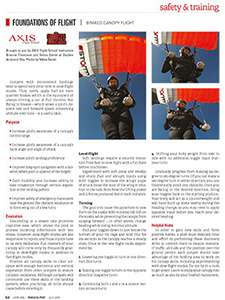 Set up for a successful skydive and learn an advanced 2-way exit that is a component of several 4-way exits currently in the dive pool. 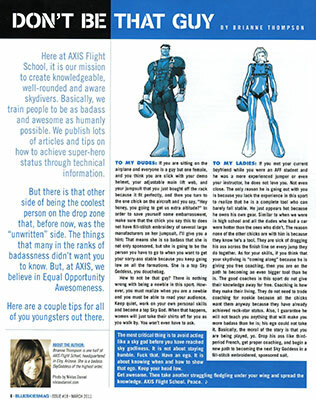 Article by Brianne Thompson with Sandy Radsek and Kim Winslow. Camera by Niklas Daniel (air) and Mark Kirschenbaum (ground). Exiting an open accordion (formation F in the 4-way dive pool) appears simple but is deceptively difficult. These instructions show the exit from a Twin Otter, the most commonly used plane for competitions. The ability to drive forward is a fundamental skill that flyers need in order to be effective in several disciplines. Jumpers use forward drive to reach another jumper or a formation, to move around in the formation from one point to the next, and to neutralize a backward drive in order to stop. Safety: avoid collision, understandi and navigate through burbles, stay with students (for rating holders). Performance: get to different vantage points (for camera flyers), make a powerful stop after diving to a base, increase your ability to fly with a wide range of people with a variety of fall rates, and improve your track with slow-flight skills. 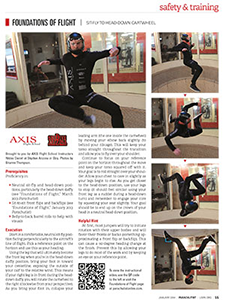 The purpose of these drills is to become more stable and mobile while belly flying, to gain the skill set necessary to begin flying with the entire body, to gain the skill set necessary to take grips on other jumpers, to rapidly recover from instability (self induced, caused by others, even on the hill), to counteract unwanted movement during maneuvers. 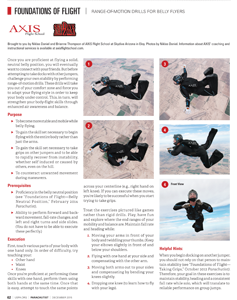 Learn how to effciently perform Block 7 of the 4-Way Formation Skydiving Dive Pool (Side Buddies) and increase your basic knowledge of how to make 360-degree turns from a sidebody for 8-way, 16-way or any size sequential formation. In a side-slide, your goal is to move horizontally toward a target. Though you&apos;ll use similar inputs as you do when turning, you&apos;ll drive both your upper and lower body in the same direction. Perfect a fundamental block move from the 4- and 8-way dive pools. Better understand “the hill” (the shift in the relative wind during the first few seconds after exit). 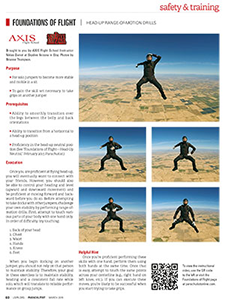 Learn an essential formation skydiving skill (2-ways to big-ways) and a position used for hop and pops, camera flying and reserve-side AFF instruction. Although all jumpers may feel familiar with the neutral belly position, many do not use proper technique since some of the methods used to teach it actually encourage improper positions. Many jumpers mistake it as only a deployment position and miss, that it is also an essential flying position. 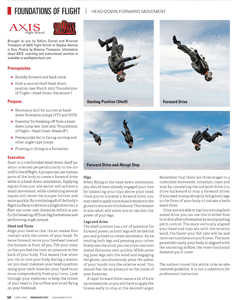 Safety: Recognize and either avoid or navigate through a burble, avoid getting “taken out” if another jumper goes low on a formation, and avoid having a burble affect stability during a skydive. 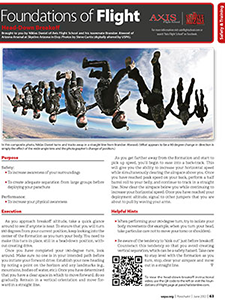 Performance: Learn a fundamental skill for performing 4-way and 8-way formation skydiving blocks and further develop your fall-rate skills and apply them to a new task. Camera by David Cherry and illustrations by Niklas Daniel. 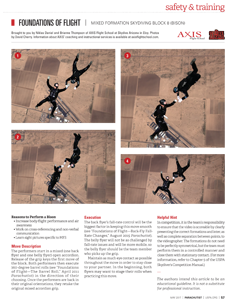 Although MFS teams generally put most of their training focus on the performers, the camera flyers&apos; performances are critical to success. The mixture of horizontal and vertical formations makes flying camera for an MFS team very challenging because there is a lot of active flying necessary to get the best camera angle. Article by Niklas Daniel with Steve Curtis. 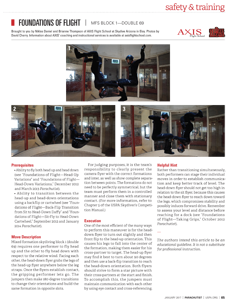 The double spock is a competitive freefly maneuver found in the open-class compulsory dive pool. It consists of a head-down flyer and a head-up flyer facing one another and docking with a single hand on each other&apos;s heads. The 2-way flower is a great exit for jumpers just learning to fly head down. Though there are different ways to launch it, this one, launched from a left-door aircraft such as a Twin Otter using front- and rear-float positions, is the most basic. Camera by Seth Studer (aerial) and David Amett (ground). 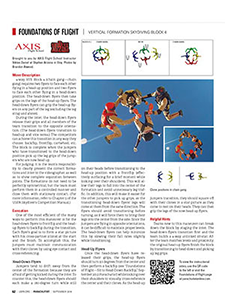 Learn all about exiting a Mixed Formation Skydiving Random B (Double Spocl), from move desciption, prerequisites, set-up, to execution and helpful hints. 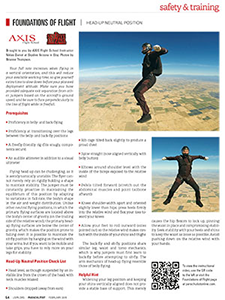 Increase your ability to score points during a mixed formation skydiving competition in which the half rebel (MFS random formation N) is the first point by launching it from the aircraft. 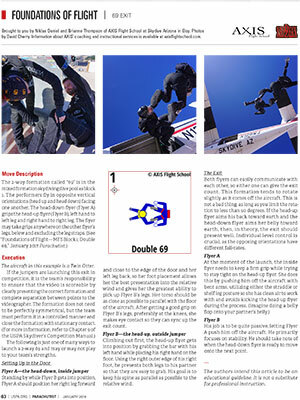 Learn all about the Mixed Formation Skydiving Block 1 (Double 69), from move desciption to execution and helpful hints. 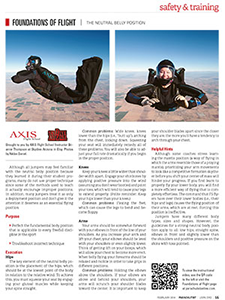 Learn all about the Mixed Formation Skydiving Random F (Totem), from move desciption to execution and helpful hints. 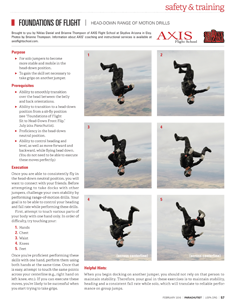 The 2-way formation called “69” is in the mixed formation skydiving dive pool as block 1. 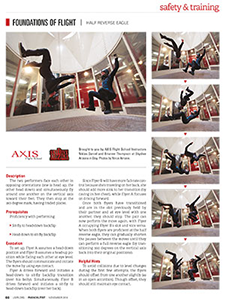 Learn more about this exit, where performers fly in opposite vertical orientations (head up and head down) facing one another. The sole-to-sole is a competitive freefly maneuver, formation FF-3 of the open-class compulsory dive pool. 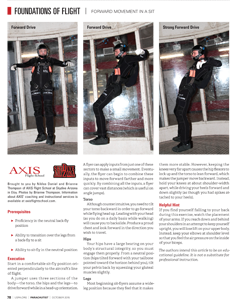 It consists of a head-down flyer and a head-up flyer making stationary contact with the sole of the other jumper&apos;s foot. 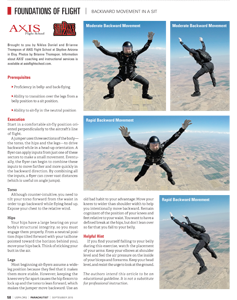 Learn all about the Vertical Formation Skydiving Block 4 (Chain Gang), from move desciption to execution (head-down and head-up flyers), and helpful hints. 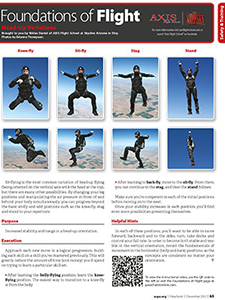 Learn all about the Vertical Formation Skydiving Block 8 (Buddy), from move desciption to execution, and helpful hints. 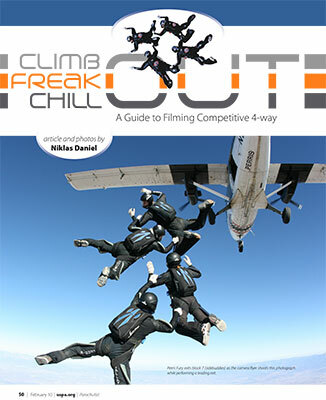 When transitioning from a head-up to a head-down position, most vertical formation skydiving competitors transition over their backs instead of performing cartwheels. 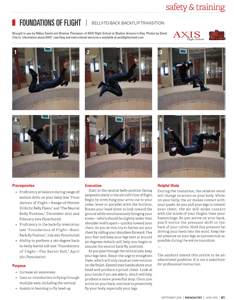 Though the end result is the same, the back flip has more dynamic range, is more aerodynamic and is easier to control than a cartwheel. The two performers face each other in opposing orientations (one is head up, the other head down) and simultaneously fly around one another on the vertical axis toward their feet. They then stop at the 180-degree mark, having traded places. Increase your ability to reach a formation and fly relative to others. Increase your ability to take and maintain grips. There are many ways of flying head down. Flyers can use the various terminal velocities (fall rates) of these positions to their advantage. 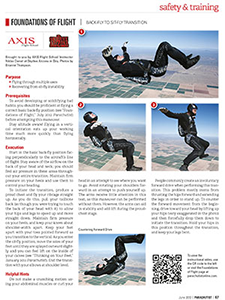 This is a necessary skill for success at head-down formation jumps (vertical and mixed formation skydiving) which can help you gain the ability to better deal with leg traffic while flying in close proximity to others. The purpose of these drills is for solo jumpers to become more stable and mobile in the head-down position and to gain the skill set necessary to take grips on another jumper. Increase air awareness, stability and mobility. 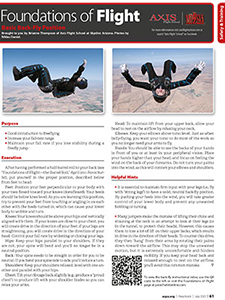 Improve your vertical and mixed formation skydiving skills. The purpose of head-down turns is to create a heading change, increase your basic flying proficiencyand your overall body awareness. 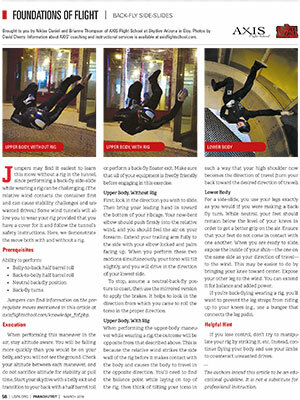 Increase your stability and range in the head-down orientation by learning different leg positions. The goals of this drill are to increase your mobility and to help you gain the ability to transition from one flight mode to another mid-jump. 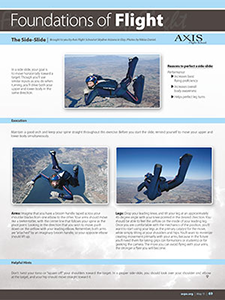 Learn a skill used extensively in vertical and mixed formation skydiving. 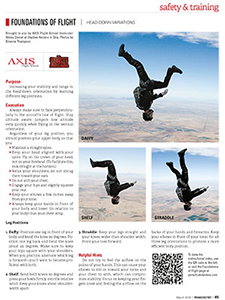 Learn to have greater mobility while flying head-down, as well as while angle-flying. 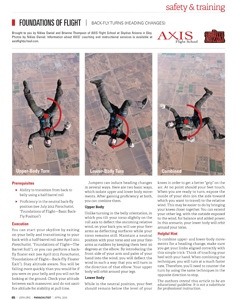 Before you attempt this maneuver, you need to be proficient in performing a half-loop from the head-up to head-down orientation and a half-loop from the head-down to the head-up orientation. 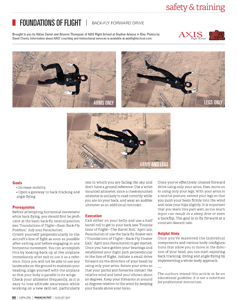 Learn a basic transition for the 2-way mixed formation skydiving dive pool and get an introduction to the half-eagle move. 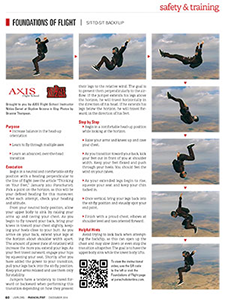 Before you attempt this maneuver, you need to be proficient in neutral sit-fly and head-down positions, particularly the head-down daffy, with sit-to-sit front flips and backflips, as well as belly-to-back barrel rolls to help with visuals. Article by Niklas Daniel and Sara Curtis; . 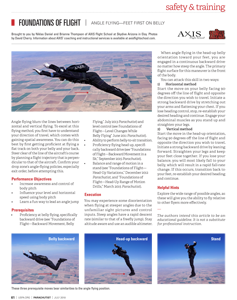 Vertical Formation Skydiving (VFS) is a new and strongly emerging discipline, which combines the body-flight skills of freeflying and the mental skills of formation skydiving. 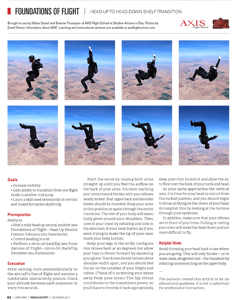 In the past, very few skydivers have had the ability to take part in this discipline because it takes a certain level of proficiency of flight, and a complex understanding of formations. 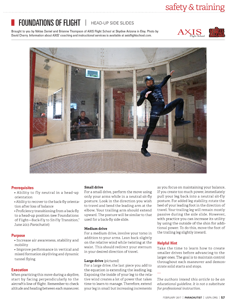 Today wind tunnels are springing up all over the globe, assisting skydivers in their quest for awesomeness. 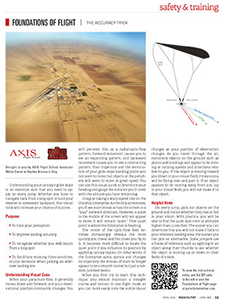 (…) In this article we are going to take a closer look at the camera flyer. Even though there may be some similarities in the responsibilities between camera flyers on the horizontal and vertical axis, with the addition of a greater fall rate speed and added dimensions of the formations, filming VFS is probably one of the most difficult disciplines to shoot. 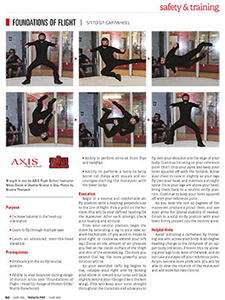 Here we check out some tricks and traps of this fun and challenging position. Your fall rate increases when flying in a vertical orientation, and this will reduce your available working time, so give yourself extra time to slow down before your planned deployment altitude. 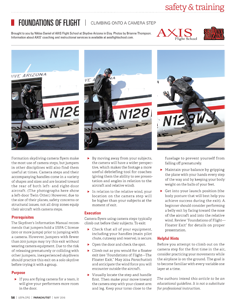 Make sure you have provided adequate exit separation from other jumpers based on the aircraft&apos;s ground speed, and be sure to face perpendicularly to the line of flight while in freefall. This installment is for solo jumpers looking to become more stable and mobile in a sit and to gain the skill set necessary to take grips on another jumper. 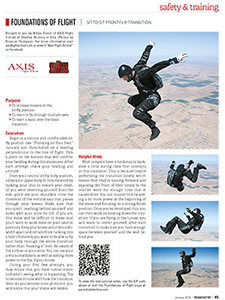 Sit-flying is the most common variation of head-up flying, but there are many other possibilities. By changing your leg positions and manipulating the air pressure in front of and behind your body simultaneously, you can progress beyond the basic sit-fly and add positions such as the knee-fly, stag and stand to your repertoire. Whether you are just learning to sit-fly or have simply hit a plateau in your learning curve, fine-tuning your basic head-up body position is worth the time. 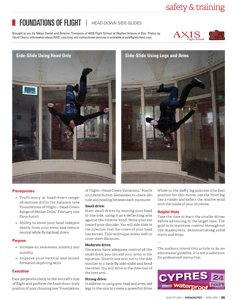 Many jumpers, even those for whom sit-flying initially came easily, find themselves stuck in place or unstable if they try to move from a neutral position to drive forward or take a dock. This article explains the basic mechanics of the sit orientation and offers solutions to common problems. 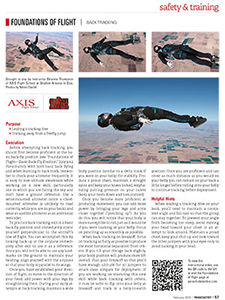 Learn the proper techniques for the most common sit-fly exits: front and rear float. Jumpers can perform this dive as a 2-way or break it into its components for a solo dive. 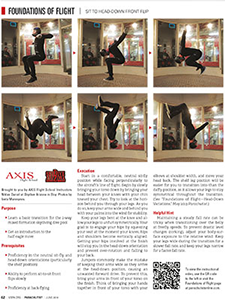 Increase your ability to chase and fly relative to others and learn an important skill for taking and maintaining grips! 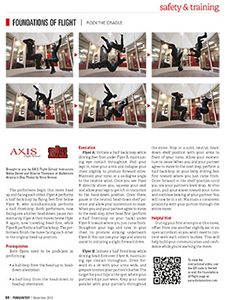 There are many ways of flying head-up or vertically oriented, and a flyer can take advantage of the various postures and their resultant terminal velocities (fall rates). This ability will help you to perform advanced arm turns (mantis position) on your belly, hold a solid, neutral back-fly position, perform back-fly to sit-fly transition, hold a solid, neutral head-up position, etc. Increase your balance in head-up orientation. 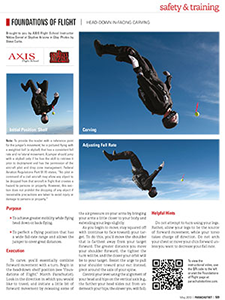 Learn to fly through multiple axes and an advanced, over-the-head transition. 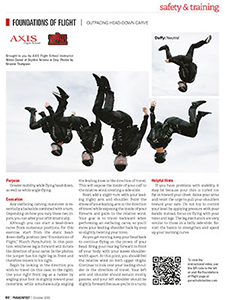 The purpose of this drill is to increase balance in the head-up orientation, to learn to fly through multiple axes, and to learn an advanced, over-the-head transition. 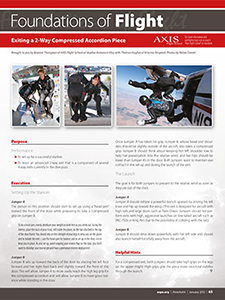 Increase your balance in the sit-fly position, learn to fly through multiple axes, and learn a basic, over-the-head transition. The purpose of this drill is to enhance the communication and rela-tive-work skills of those jumpers who are proficient in sit flying but struggle with taking grips. Unlike a standard slider, a collapsible slider has two sewn-in channels that each contain a cord with a tab that sticks out the trailing side. This allows you to change the shape of the slider to resemble a bowtie with two strings dangling behind. Learn about the benefits and the execution of collapsing a slider. Where previously only highly experienced canopy pilots have used a RDS, now more skydivers with less experience are jumping them. Are they using this piece of gear as a fashion statement or status symbol, or are they using it for its function? Video by UPT, Greg Rau. Experienced jumpers around the world are reporting more and more incidents involving the new era of cheap, small cameras such as GoPros and Contours, especially when combined with low experience levels. 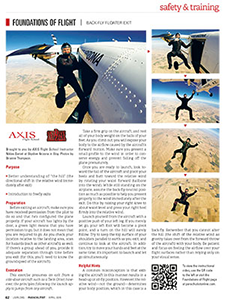 Bryan Burke, S&TA at Skydive AZ, talks about problems and indicents regarding the use of cameras. If you find your-self near another jumper on opening, you will be able to quickly and effectively turn away to avoid a canopy collision. In addition, it&apos;s a good idea to turn away from the aircraft&apos;s line of flight after a full-altitude jump, just in case the group behind you did not give adequate separation. 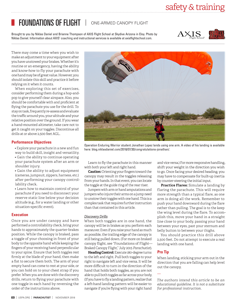 The term "Kiting" refers to flying your parachute overhead while you're on the ground. The exercise provides feedback that you'llbe able to see, as well as feel through your harness and hands. 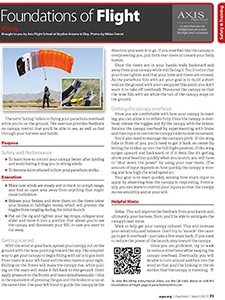 Learn how to control your canopy better after landing and avoid having it drag you in strong winds and become more attuned to how your parachute works. Die Bezeichnung Sky Diving bekommt eine dramatisch andere Bedeutung, wenn ein Springer bei der Landung – statt festen Boden zu spüren – weit mehr als nur nasse Füße bekommt. Damit es in einer solchen Ausnahmesituation nicht „drunter und drüber“ geht, sondern rein und zügig wieder raus, empfiehlt sich eine ent­sprechende Vorbereitung. There may come a time when you wish to make an adjustment to your equipment after you have unstowed your brakes. 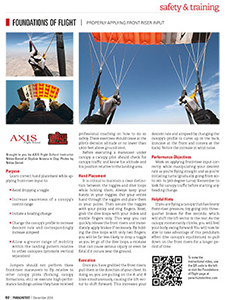 Whether it&apos;s routine or an emergency, having the ability and know-how to fly your parachute with one hand may be of great value. See above. The content is available in French and English. Article by Niklas Daniel, Barry Holubeck and Will Kitto. Camera by Barry Holubeck and Will Kitto; Diagrams by Niklas Daniel. 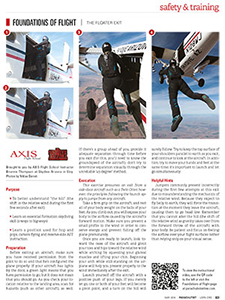 A wing-suit flying relative to a canopy is not a new concept; however in the past it has always been considered a stunt rather than a potential discipline. As wing-suit and canopy technology continues to rapidly improve, we can almost guarantee that mixed formation flights will become more commonplace in the future. Therefore it is imperative that we take a closer look at what makes this activity possible and address some of the potential dangers associated with it. This form of flight is very new and safety is of great concern. By no means are we experts on the subject, but we would like to share some of the information we have accumulated over the last year during our training camps. 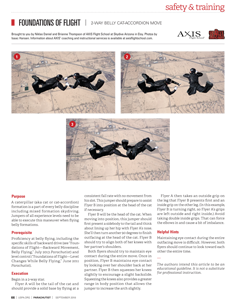 Skydivers who use cameras typically mount their equipment to their helmets in order to keep their hands clear to maneuver in freefall and operate their parachute systems. Looking through the camera&apos;s viewfinder to aim and center the shot is not an option. Enter the ring sight. 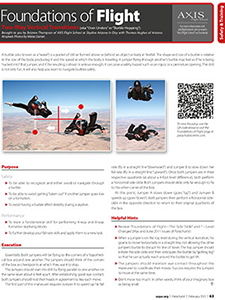 Formation skydiving camera flyers make the most use of camera steps, but jumpers in other disciplines will also find them useful at times. Camera steps and their accompanying handles come in a variety of shapes and sizes. However, due to the plane size, safety concerns or structural issues, they cannot be found at all drop zones. Article by Iveta "Murv" Muravyeva. U.S. Army veteran Joseph Grabianowski sustained severe wounds from a roadside bomb explosion in Afghanistan May 29, 2012. He underwent a series of grueling surgeries that resulted in bilateral hip disarticulation-amputation of both legs at the hip joint. 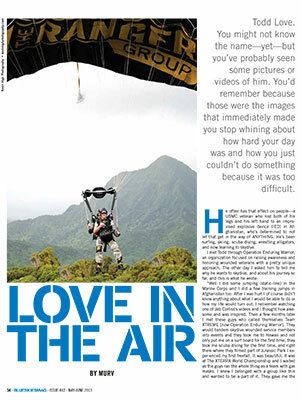 Skydiving had been one of Joe's goals before he was wounded in Afghanistan, but solo jumping did not seem feasible due to the severity of his wounds. 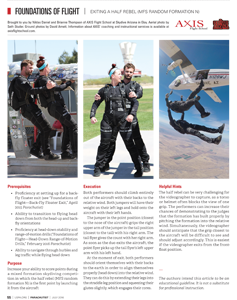 Operation Enduring Warrior Skydive (launched in 2013 as Operation X-Wing) had a very successful first year of operations and is continuing its mission to facilitate initial skydiving training for America's wounded warriors in 2014 and into the future. 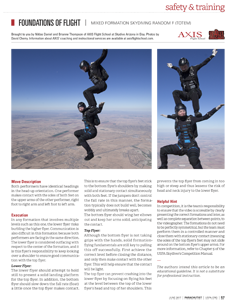 The skydiving community is going above and beyond to provide support for the program. Camera by Niklas Daniel et al..
Todd Love. You might not know the name – yet – but you've probably seen some pictures or videos of him. You'd remember because those were the images that immediately made you stop whining about how hard your day was and how you just couldn't do something because it was too difficult. You may have wondered, "So what if…well, how will he…what about…?" After a year of coordinating, planning, tunnel training and research and design, Todd finally had a chance to answer the skeptics. 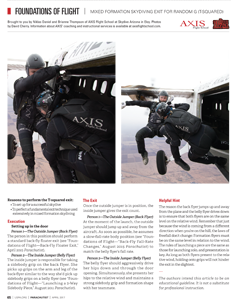 D-Day (literally – it was June 6) finally came and Otter 1 had six slots dedicated to Todd's first jump: Todd Love (the student), Brianne Thompson and Niklas Daniel (AFF instructors), Mike McGowan (who volunteered his talents for photography), Wes Moraes (video), and Murv (just lurking). History was made! 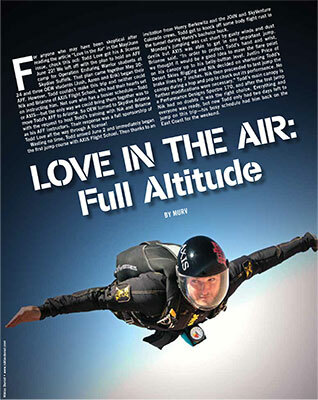 Todd caught the skydiving bug after his first tandem with Mike Elliott and inspired Operation Enduring Warrior (OEW – enduringwarrior.org) to begin researching skydiving training. 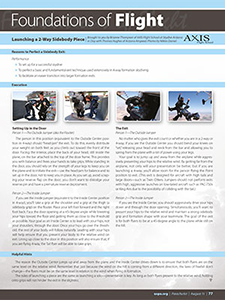 This was the beginning of Project X-Wing, a program established to facilitate initial skydiving training (AFF through A license) for combat wounded veterans. OEW set a goal of seeing each jumper (class 13-01 is four strong) all the way through to their USPA A license, which would ensure they could continue on in the sport and jump at any DZ independently. Skydivers know nothing could take the place of skydiving in their lives, and many turn to it for solace when faced with adversity. This thought brought about Operation X-Wing, a skydiving program under the umbrella of Operation Enduring Warrior, an organization whose objective is to create awareness of, provide support to and honor our nation's wounded warriors. 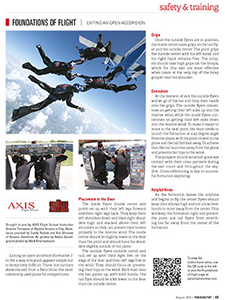 OXW facilitates initial skydiving training (AFF through the A license) for combat-wounded veterans.